Do you remember last week I mentioned two other polishes I got from the fab Rainbow Connection UK along with the Cirques? Well tonight you finally get to see them! I've been so excited to swatch these and (im)patiently waiting for my nails to grow a little longer so I could be happy with my swatches. 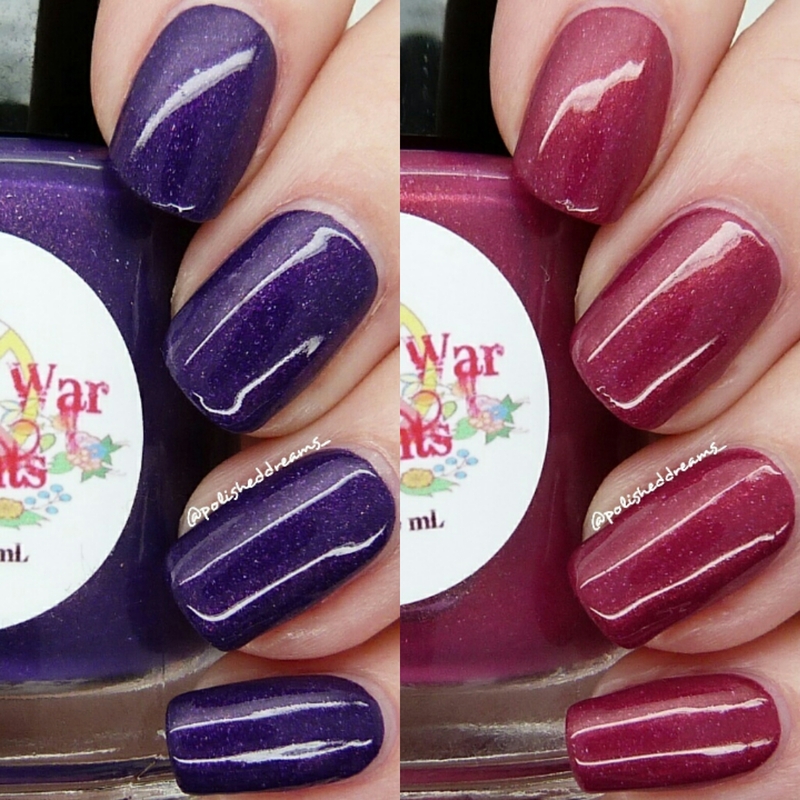 These polishes are two RC exclusives from Native War Paints, an indie brand from the United States. This was my first time trying NWP polishes so I couldn't wait to see what they were like. Heroine is a gorgeous deep purple which, as I'm sure you all know by now, is totally my kind of shade! It contains that lovely scattered holo and also has a pinky/red shimmer that runs through it but unfortunately it doesn't show up well on the nail. As I said earlier, NWP is a new brand to me so I was interested to see what sort of formulas the polishes had. I'm pleased to say that they weren't too thick or thin and were lovely and smooth. One thing I did notice when applying was that I had to be slightly quicker than usual and not go over the same bit too much otherwise things got a bit messy. It was easy enough to do so didn't cause any problems here! Swatch shows two coats with Glisten & Glow HK Girl topcoat (also available from RC). The other polish is Girl About Town, a stunning deep berry pink with holo and gold shimmer. I don't want to shock you all but I think this may actually be my favourite of the two... I'm not ill I swear. Purple will always be my favourite colour but there's just something about this polish that I really love! Like Heroine, this had a lovely formula making it so nice and easy to apply. I definitely need to use it again for some nail art ASAP so let me know if you have any ideas as I want to do this beautiful polish justice. Shown here is two coats with topcoat. Well I think it's fair to say that dipping into a new brand has been a great success! I'm not sure my bank account will agree though...especially with their new Copper Penny Collection coming out soon which looks absolutely amazing! If you've been thinking about getting some Native War Paints but aren't sure then I would definitely say go for it! I was not at all disappointed. Girl About Town is currently sold out on RC's site however it isn't limited edition so will be returning. Fortunately Heroine is still available so you can get that here. Have you got any Native War Paints polishes? What would you recommend I buy next?